Brighton & Hove Albion missed out on the chance to go top of the Championship as they went down 2-0 to Leeds United this evening. With leaders Newcastle being held to a 0-0 draw at Birmingham, the Seagulls could have leapfrogged the Magpies at the summit with a victory at Elland Road. But Chris Wood's 63rd-minute header and penalty five minutes from time separated the sides as Leeds climbed up to fourth in the table. It was a slow-starting affair as Garry Monk's side were more than a match for Albion in a game that had to wait until the 55th minute for its first shot on target. Despite the result, Albion remain six points clear of third-placed Huddersfield Town, who were sent crashing to a shock 4-0 defeat at relegation battling Bristol City on Friday night. Chris Hughton's side also remain a point behind Newcastle with a tally of 77, but have won just two of their last seven games on the road. Just three minutes after squandering the best chance of the game, Wood brilliantly placed a precise header from Charlie Taylor’s cross into the top left corner three minutes after the hour. 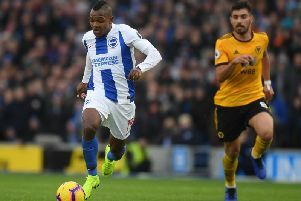 Brighton then squandered glorious opportunities through Anthony Knockaert and Glenn Murray and the Seagulls were punished when Whites substitute Souleymane Doukara bagged Leeds an 85th-minute penalty that was slammed home by Wood. The victory also brought Leeds to within eight points of the automatic promotion places with eight games to go. Brighton had the game’s first half chance in the fourth minute when Beram Kayal broke down the right flank but his cross deflected off Charlie Taylor’s legs and into the arms of Rob Green. United then had the chance to counter in the 14th minute but a Pablo Hernandez pass evaded Chris Wood, allowing the visitors to clear. A slow tempo game looked in danger of grinding to a halt though Leeds almost broke through in the 20th minute when Alfonso Pedraza fed Wood but the striker was flagged offside before Pedraza netted. United then won their first corner three minutes later, from which Kyle Bartley headed wide. Fine skill from Hernandez then earned Leeds a free-kick right on the edge of the penalty box but the Spaniard’s delivery hit the wall as Brighton cleared. United were beginning to turn the screw and Uwe Hunemeier was forced to desperately head a Hernandez cross over his own bar. The resulting corner dropped to Wood but the striker failed to anticipate the chance as the ball slipped off his legs six yards out. But Brighton then went mightily close to taking a 32nd-minute lead when Liam Cooper diverted Kayal’s cross goalwards, forcing Green into a superb full-length save. Leeds then saw strong claims for a penalty turned down when Wood went sprawling, with referee Lee Mason momentarily looking like he would point to the spot. United were on top and Ronaldo Vieira narrowly failed to play in Hadi Sacko six minutes before the break. But Brighton pressed towards the end of the half, with Cooper producing a fine header to clear a corner, before the visitors wasted a free-kick 25 yards out when Jiri Skalak’s effort thumped the wall. In the sole minute of first-half stoppage time, a long range effort from Gaetano Berardi found Wood but the striker failed to control a difficult ball and the chance was gone. The second half began in similar fashion to the first though Brighton’s Skalak was lucky to avoid a booking for what looked like a dive in the penalty box. At the other end, Pedraza burst into the Brighton box but took too long to produce a shot and Sacko eventually curled the ball wide. For Brighton, efforts from first Skalak and then Kayal peppered Green’s goal but Leeds then squandered the best chance of the game yet on the hour when Gaetano Berardi’s cross found Wood in the penalty area but the striker’s shot was saved by David Stockdale. But there was no denying Wood just three minutes later when after fantastic work from Ronaldo Vieira, Charlie Taylor’s inch perfect cross was expertly met by the striker who placed a precise header into the top left corner. Brighton attempted to immediately hit back and forced a series of corners which Leeds survived. The Seagulls then squandered two glorious chances with 20 minutes left, first when Anthony Knockaert raced clear but shot straight at Green. Glenn Murray then escaped Bartley in the area but dragged his shot just wide of the post. Green then saved the day for the umpteenth time this season with a brilliant save seven minutes later to beat away Murray’s stinging volley. United then survived an almighty scramble in the 80th minute yet five minutes later Brighton were put to bed when substitute Souleymane Doukara raced into the Brighton box and was sent flying by Fikayo Tomori. This time, referee Mason pointed to the spot and Wood thumped home a no-nonsense penalty to send Elland Road wild. Brighton had four minutes plus three minutes of stoppage time to save themselves but that never looked likely, with Murray heading their sole remaining chance wide. Leeds United: Green, Berardi, Bartley, Cooper, Taylor, Bridcutt (c), Vieira, Sacko (Dallas 81), Hernandez (O’Kane 88), Pedraza (Doukara 75), Wood. Subs not used: Silvestri (GK), Jansson, Barrow, Roofe. Brighton: Stockdale, Tomori, Dunk (c), Huenemeier, Rosenior; Knockaert, Stephens, Kayal (Norwood 83), Skalak (March 70); Murray, Baldock (Akpom 75). Subs not used: Maenpaa (GK), White, Sidwell, Hemed. Referee: Lee Mason. Attendance: 29,767.